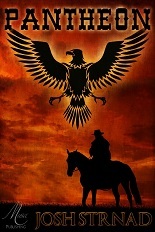 Pantheon is a decidedly different book, one that mixes Greek mythology with a western. It may seem like an odd combination, but like peanut butter and bananas or blueberries and beef (try it, trust me) they actually go together quite well. The setting of the story is that of a western. The two main protagonists are Lamont and Emma, two throw-away people on the run. Lamont got involved with a crime and is a fugitive, and Emma is fleeing a life of prostitution. Somehow, these two people on the bottom of the social ladder have been selected by the King of the Gods to take action to keep hope alive among humanity. Assisting the unlikely pair is Apollo and Hades, but opposing them is mighty Zeus. The book is well-written with very nice characterization. Each major and even minor player has his or her own voice and personality. These are not cookie cutter characters. While the gods were somewhat distant, as befitting their very existence, it was easy to empathize with Lamont and Emma. The book flowed well. There were no dead spots. The action scenes were well-written and kept the storyline moving along. Proofreading was generally satisfactory. Editing was good, although there was at least one minor inconsistency that should have been caught. Overall, though, proofing and editing were mostly invisible, exactly as they should be. They did not interfere with the story. This was a clever, entertaining book. I enjoy covering new ground when I read, and this book fit the bill. I think the author has a good future in writing in front of him, and I look forward to reading more of his work. For more reviews or to buy Pantheon from Amazon.com, click here.